Two days in one...sounds good to me! We stayed up late to set up the garage sale last night because we put off doing it for most of the day. I do not like that job. Having to put a price tag on your possessions is a bit traumatic for me. But then I was inspried afterwards to work on this page so that allowed me to unwind a bit. I sure am grateful for my creative time. Don't you feel better having done something you dreaded doing? Way to go! 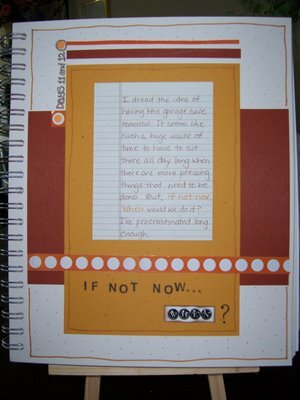 Great journal entry!